Raised in 1852, this Regiment became the 4th Battalion the East Surreys, in 1881. As an Extra Reserve battalion it was responsible for training and dispatching 4,732 reinforcements mainly to East Surrey battalions on the Western Front in the years 1914-1918. It was disembodied in 1919 and disbanded in 1953. Two stands of Colours are in existence. 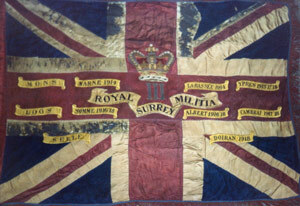 The first is of the large size, presented in 1854 and laid up in 1877; these hang very high up in the tower of All Saints’ Church, Kingston-upon-Thames, near the Regimental Chapel of The East Surrey Regiment. The three foot nine inches by three foot stand which succeeded these Colours was presented on 6th July 1877 by HRH Princess Mary Adelaide, Duchess of Teck. 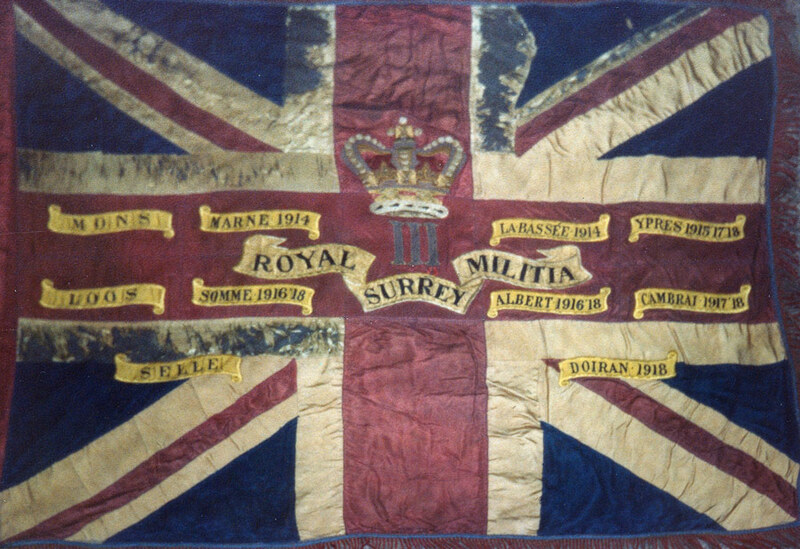 The Queen’s Colour bears ten Great War battle honours. They are kept (but not displayed) in the Queen’s Surreys museum at Clandon Park; the Queen’s Colour shows some signs of wear, and pikes are not attached.